The issue of mobile app usability is a big concern for businesses today. The users expect a seamless mobile app experience. Right from onboarding to checkout, there should absolutely be no glitches. In this context, usability plays a critical role in enhancing the user experience. The ease and comfort of accessing or completing a certain goal through a mobile app contributes significantly to mobile app usability. Hence, overlooking usability issues can impact your business negatively. Why would a customer use your app if they can’t understand its UI or have issues while completing their task seamlessly? They won’t think twice before abandoning it. If we go by the statistics, it is seen that around 88% of online user won’t return to a mobile app if they face usability issues within it. In fact, 70% of online businesses fail because of bad mobile app usability. Hence, it becomes imperative for a business to understand and tackle such usability issues. Let’s have a look at six best practices you can incorporate to fix the mobile app usability issues. Work on multiple platform usability: It is vital to building a mobile app which can be used on any smartphone irrespective of it having an Android or iOS platform. It can be frustrating for users to be unable to run the app on their mobile because of platform issues. Hence, it is critical to offer multiple platform usability for your app. Also, it should be kept in mind that iOS and Android platforms are different from each other in programming, design, and user interface. So, you must incorporate tailor made optimized features for both the platforms where users can interact and engage with the app intuitively. Allow single sign-up process: If you want to enhance your app usability, make sure to provide your users with a single sign-up process. The simpler the process of registering, the higher are the chances of user retention. Allowing users to sign up instantly through their social media accounts like Facebook, Google+ makes onboarding flawless for them and ensures the long-term success of your app. Make navigation simple: Poor navigation is a major concern when it comes to app usability. If the users find it difficult to find a product they are searching for, chances are they would abandon your app. Hence, it becomes imperative to make the users clearly understand how to navigate through the app and complete their goal while looking for a product or service. Furthermore, avoid incorporating unnecessary features which are of no significance and can complicate the whole navigation process. Provide relevant and specific content: Presenting relevant, clear and app specific content significantly enhances mobile app usability. So, it’s better to simplify the content of your app as much as possible. However, make sure to include the necessary content the users would require to complete their goal. A complete set of concise and clear information should be given to the users when they are buying a product or service. In this context, it is advisable to tailor your content for the mobile app and not simply copy the web content. Too much of information can complicate the whole process resulting in frustrated users. So, make it as simple as possible for users to understand the content and carry on their buying process forward. Include auto filled customer data: Allowing users to save their shipping/ billing address and credit/ debit card details makes the transaction process easy. Auto filled customer data not only improves mobile app usability but also enhances the customer experience as they can easily continue to shop without having to repeatedly add their information. Incorporate user testing and feedback: Mobile app usability can be improved considerably through user testing and feedback. Instead of assuming what users expect, wouldn’t it be great if you could actually get an idea about it? Allow users to give their valuable feedback through in-app reviews and get an insight on their preferences and needs. Also, resorting to mobile A/B testing platforms can let you test your app usability. A/B testing lets you analyze two or more variations of a particular app’s layout and design. From comparing the effectiveness of buttons to getting an idea about the conversion rate through a particular layout, A/B testing works a great deal in enhancing mobile app usability. The user’s perception about your mobile app can work a great deal in making or breaking of your business. Mobile app usability works as an indicator for analyzing the positive and negative aspects of an app. 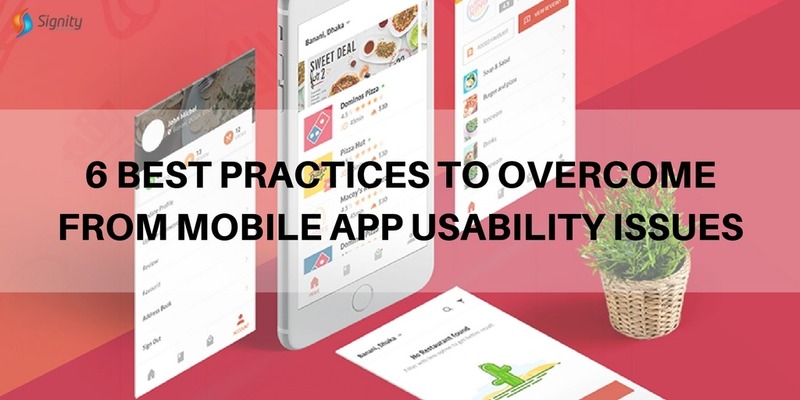 Hence, incorporating the above-mentioned practices of app usability can be a milestone for the success of your app by converting prospective customers into loyal, long-term users, thereby, providing ample revenue for your app. Want to develop a mobile app well efficient in usability? The one which can accelerate your sales and boost your revenue? Signity Solution Pvt Ltd is a leading Technology services company having an excellent team of developers working extensively towards providing their clients with highly effective, value-based mobile, web, and cloud solutions. For any queries, feel free to contact us. We’ll instantly reach out to you.